Though every year has brought me closer to my school, but this year holds special place in my life.my experience as a part of this school has been like an amazing journey full of excitement, joy and exuberance.I deem it a very great honour and privilege to be a part of the school council and make this year a very remarkable one.I will take part as a school leader to lead the school in a positive direction. For me,being a school leader is not the position or title but it is about action and example which can make a difference.I stand here as a school leader not just to lead you but to work in collaboration with each one of you to work with zeal,devotion and determination. I deem it an honour and privilege to be part of the school council and make this year a memorable one. I take pride to represent the Sacred Heart family and contribute as a righteous leader. Serving this institution is a dream come true for me and I hope that it will be fulfilled as desired. I extend my sincere thanks to respected sister principal for bestowing me with such a golden opportunity and of course the teachers and entrusting me with such a towering responsibility. This responsibility has given me an ocean of opportunities nurture my talents. I also congratulate all the elected members of the school council and hope that teamwork would leave no stone unturned. My teachers and friends have not only supported and boosted but also made me believe in myself. Teacher’s guidance and motivation will always help us to keep up the discipline of the school. I promise to abide by all school norms and regulations and work determinately for the school motto for truth and service. At last I want to say that the foundation stone for a balanced success are honestly, character, integrity, faith, love and loyalty. So, let’s hope that all these factors breeze in throughout the year. School is a temple of learning. We as students tread the path of wisdom and knowledge and achieve our goals. The wings of righteousness, confidence and the conviction to complete our endeavours. Though every year has brought me closer to my school, but this year 2016-2017 holds a special place in my life. I have been selected to represent my school in the capacity of school leader. I am grateful to Sr. Principal who found me capable enough to hold this post of prestige. I am committed to my school and will execute all my duties to the fullest. Our guide, our Principal Sr. Tesvin has always been an inspiration for the students. She has given us an ocean of opportunities to showcase our talents and channelize our energies. She is the captain who steers this ship with complete dedication. We the crew, have nothing to worry in the safe tender and gentle embrace of her. I take this opportunity to thank all my teachers who have always guided our path and i assure every member of this institute that no compromise will be made in executing my duties as a school leader. Teachers’ guidance and motivation will always help us to keep up the discipline of the school. To my fellow students i would like to say that this school is the best place you’ll ever be in. This school gives us opportunities to find our true selves and to nurture our talents by displaying them. Value your school days, friends, you will never get them back! I’m proud to be a part of the Sacred Heart family. This school has given me memories that i will always cherish. This day has come into my life with the grace of the lord almighty and with the blessings of my principal and teachers. I have been appointed as the school leader. But my intentions will be to remain your affectionate student, your good friend and then lead the school with your cooperation. I entirely commit myself to the school motto “for truth and service”. I believe if you truly want to change your life, you must first be willing to change your mind. So I take this initiative to first bring change within me and promise to be persevering and more diligent in all my duties. If this thought is brought into practice by everyone, I assure you that the day will not be far when our school become the best in the country. As a team, if we take a step forward, we will climb the ladder of success. Let us begin today itself as one should never say, ‘There is still time’ as it becomes too late sometimes. For my friends in the student council, I would like to narrate a quote “When the bird is alive, it eats ants. When the bird dies, ants eat it”. So this power and position keeps on changing. So let this authority not affect your minds as you may be powerful than you. And be nice to people on your way up, as you might meet them again on your way down. Once again I would like to thank Sister Principal for giving me this wonderful opportunity. 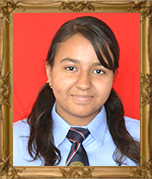 This year has given me the golden opportunity to hold high the glorious flag of Sacred Hear Convent Sr. Sec. School. 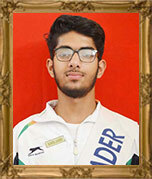 It gives me an immense pride and elation to work for my school as the Head of the School Council. I promise to be persevering and more diligent in all my duties. I whole heartedly commit myself to the school motto “For Truth and Service”. I promise to live up to ethics and virtues which are the integral part of our school. As a team, if each one of us takes a step forward we will climb a ladder of success and the day is not far when our school be the best in the country and this can only be achieved through continuous efforts and cooperation extended by you because I believe that no General has ever won a battle without his men. The spirit of togetherness, the qualities and the leadership skills are the powerhouse of the Student Council and I would like top remind my friends, the members of the Student council that this power and position keeps on changing. So let this authority not affect our attitude. Just remember one thing that “when a bird is alive, it eats ants but when the bird dies, ants eat it”. And be nice to people on your way up as you might meet them again your way down. We hope that this Golden Jubilee Year of our school, we bring laurels to it. I sincerely thank Sister Principal for her undeterred faith in me and I promise to never disappoint you. The word Discipline has its origin from the word Disciple which means the follower of teachings of his Guide and Guru. As a true Disciple and School leader my responsibilities have been doubled up. With every step we take forward, I will make sure that we follow what our teacher expect from us and shoulder the responsibilities bestowed upon us. I learn in Sacred Heart Convent Sr. Sec. 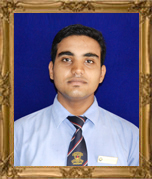 School, Jagadhri and I am serving as the head boy of the school. The ethics, virtues are the integral part of our school. The love and guidance of the teachers and our principal always keep us on the right path. The moral values thought make us a complete being. The spirit of togetherness, the qualities and the leadership skills are the backbone of the student council. May the baton of hard work and excellence be passed to the upcoming buddies of our institute.